Every once in a while, a new tech tool comes along that really makes an impact with me and my students. www.voki.com has been that website for me since last school year. 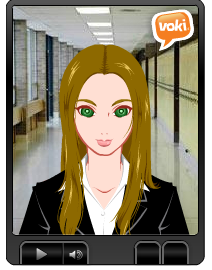 I discovered Voki when I was doing the novel study for “No Talking”, by Andrew Clements. I was online searching for activities to enrich and engage my students and saw that someone has made Vokis for the 2 main characters. I checked them out and was hooked! I used these to introduce the characters to my students, and then using Voki took off in my classroom. We did another novel study on “Julie of the Wolves” later in the year. To work on summarizing text, I made a Julie voki (the main character) and had her summarize the chapter for the class. This was the “I do it” stage. Next, we developed a Julie voki together and posted it – the “We Do It” stage. Finally, it was my students’ turn. Student One chose to use his own voice for recording, student two used one of the many, many choices available on Voki as his characters’ voice. The abundance of choices is one of the reasons we love Voki. Students not only choose voice, they choose characters physical traits, backgrounds and more. There are even animal avatars to pick from! Besides using Voki as a tool for reading instruction, I use it frequently to review or introduce History ideas. If we are learning about roles played in a war, I create Vokis to reinforce concepts to the students. Something as simple as hearing it from a Voki avatar makes it more interesting than just hearing it from me. I also review vocabulary terms using Voki. My students this school year are just getting into Voki and I can’t wait to see what develops. The site is user friendly, the students love creating these and I love the engaged learning that takes place when I use Voki in my classroom! My first graders and I have enjoyed learning about and using Voki during book buddies! The students become engaged in their learning and it takes them away from the traditional book report! We look forward to discovering new ways to use Voki! Thanks for sharing Jo! They really do love it – we have had so much fun using it with both our buddy classes! So user friendly. Thanks! Sounds wonderful, pinned, planning to share with some teachers, thanks so much! Really appreciated the information about Voki. Ms Claspill clarified a lot of things for me. Will try it in my classroom soon. I love VOKI! We had a Presidential Pet Election at the beginning of the year and I made commericals using dog faces. The kids love it! Try using Go-Animate. I make animations for study guides. The kids love it when it references something we have done in class or one of our names. Can’t wait to try it out with my third graders! What a clever way to spark student interest and to pull them into a unit of study. You can count on me using this one. I love the fact that you engage your students with enriching technology! These kids will remember this information for the rest of their lives…YOU GET IT!